John Newland (November 23, 1917 – January 10, 2000) was an American director, actor, television producer, and screenwriter. Born in Cincinnati, Ohio, Newland began his career as a teenager in vaudeville. After moving to New York City to study acting, he served in the United States Army Air Corps during World War II. After the war, he signed with Warner Bros. but was relegated to playing bit parts. By the early 1950s, Newland began to focus solely on television roles, appearing in several episodes of Studio One, The Philco Television Playhouse, Tales of Tomorrow, Kraft Television Theatre, and Schlitz Playhouse of Stars. 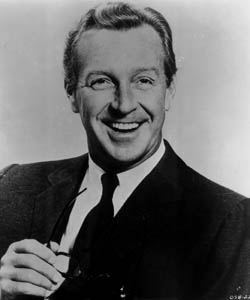 After directing episodes of Letter to Loretta in 1953, Newland went on to direct two episodes of Bachelor Father, Alfred Hitchcock Presents, and Thriller (US TV series). His feature film directorial debut That Night! (1957) was nominated for two British Academy Film Awards. In 1959, Newland became the host and director of the paranormal television series One Step Beyond. The series ended its run in 1961 and Newland later hosted its short-lived counterpart The Next Step Beyond in 1978. Following the demise of his One Step Beyond, Newland directed one of the early 1964 The Man from U.N.C.L.E. episodes called The Double Affair. His episode was given additional footage and released to cinemas as a motion picture titled The Spy with My Face. In 1966 he produced and directed all episodes but one of the serious spy series The Man Who Never Was for which he also served as a writer. Some episodes were strung together and released outside the United States as a film called Danger Has Two Faces. He later directed episodes of The Sixth Sense, and Police Woman. In addition to acting, directing, and screenwriting, he produced several television movies. On January 10, 2000, Newland died of a stroke in Los Angeles.